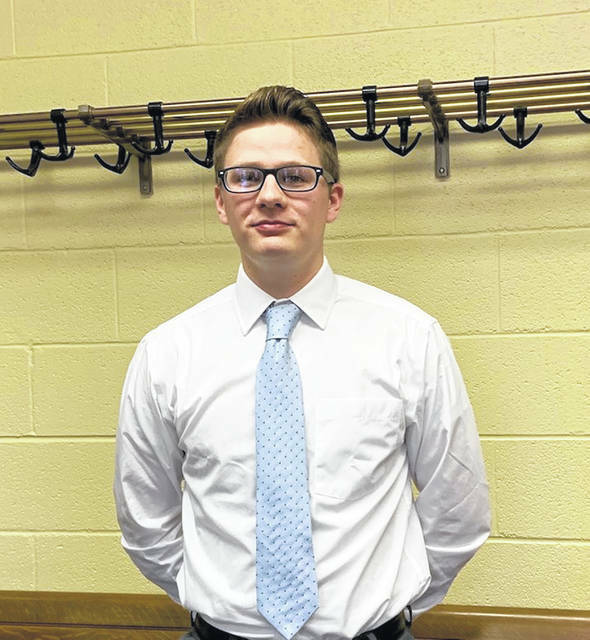 Trevor McKenzie from Rosemount, was hired as a new police officer for the New Boston Police Department. Chief Steven Goins of the New Boston Police Department gave awards to two of his police officers and the New Boston Village Council hired another officer for the Department. The regular meeting for the New Boston Village Council took place Tuesday evening with all six members in attendance. There were no petitions to be read and no member of the public wished to speak at this meeting. Mayor Junior Williams presented the council members with a letter recommending they hire Trevor McKenzie as a 1st-year probationary police officer for the New Boston Police Department, pending his passing of all requirements. Councilman Jon Mills made a motion to hire McKenzie and Councilman John Whisman seconded it. All members voted yes to hiring McKenzie. Goins presented tocouncil that Officer Kyle Galloway and Captain Robert Deerfield had received awards for their work in catching criminals in New Boston. Deerfield was commended for his work in catching an arson suspect at the scene and Galloway was commended for a traffic stop where he caught a lady with crystal meth. In other business, a letter was received from Melinda Burnside, Superintendent of New Boston Local Schools thanking the village for everything they have done on behalf of the New Boston Local Schools, in the letter she had mentioned several things they had done for the schools. A discussion was had on the amount of unpaid fines and warrants and what possibly could be done to collect on them, as some of them were quite old and had still not been paid. Williams brought to council that there was a heating and air unit on top of the municipal building that had to be replaced according to a Heating and Air expert who was checking the units. Williams said that Fire Chief Chris Davis had checked the unit out and he agreed that it had to be replaced. The mayor said they were going to use money that had already been appropriated for repairs within the building, to pay for the new unit. Williams also brought up that they had the money for the 4th of July Fireworks paid and that they would have these on July 4th. Steve Hamilton, village administrator, said he has been talking to some of the local businesses to tell their semi truck drivers to stay off of the side streets in New Boston and if need be to use Maple Street. He also informed council that ODOT would be closing one lane on US 52 West for one week for sewage work. Clerk Lana Loper read the second reading of Ordinance 10-2019, an ordinance authorizing the issuance of a permit to the Scioto County Shrine Club to solicit charitable contributions from occupants motor vehicles on a highway pursuant to permit to be issued ty the clerk, at the direction of council; and declaring an emergency. Mills made the motion to suspend the rules to adopt and councilman Ralph Imes seconded, then Mills made the motion to adopt and councilman Ryan Ottney seconded it. All were in favor. Next reading by the clerk was the 1st reading of Ordinance 11-2019 an ordinance instituting pay raises for elected officials of the Village of New Boston. Councilman Dan Fetty made the motion to declare it as an emergency, due to a time limit for May elections. Whisman seconded the motion, but on a vote, councilman Don Raike, Mills and Imes voted against the emergency, so the motion failed. Following this, Whisman made a motion for a second reading and Imes seconded that and all were in favor. Finally, a resolution was read by the clerk, authorizing participation in the ODOT Road Salt Contracts awarded in 2019; and declaring an emergency. Mills made a motion to suspend the rules and Raike seconded and passed by the other members, then a motion was made by Mills to adopt the resolution and Imes seconded and Council passed that as well. The meeting was then called for executive session to discuss personnel.